When I first walked into the Frank R. Williams Center, I thought to myself "this is no place a camera can or should be used". The dark cavernous arena was home of the Coolidge High School Colts and the annual Caron Butler Classic. The Classic was a showcase of local high school basketball teams hosted and sponsored by the former Washington Wizard. 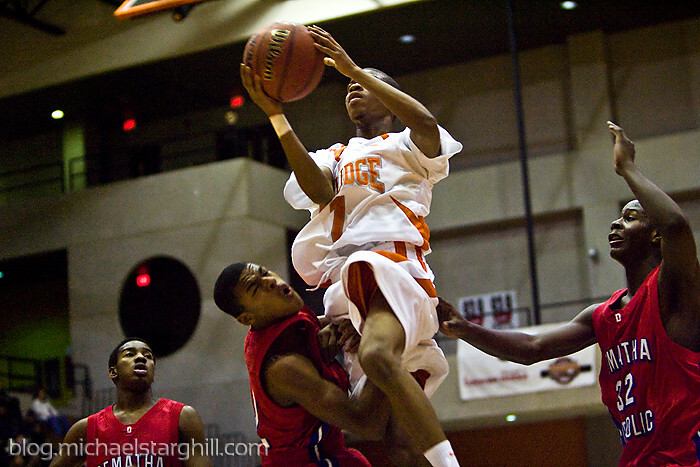 The date was December 4, 2007 and the final game was between Coolidge and Dematha coached by Vaughn Jones and Mike Jones, respectively (both alums of the DeMatha program). I don't remember the fine details of the contest, but according to this video, DeMatha won by two. This photo was taken with a 70-200mm lens at 1600 ISO, 1/320th at f/2.8. The most interesting thing about this picture are the people in it and all the basketball talent that lives in the DMV. From left to right, Philip Green, Derrick Washington (Coolidge), Quinn Cook, and Josh Selby. Paul VI and the VI Man!